Dir In 2001, DIL partnered with Khwendo Kor (KK) to open girls’ schools in this neglected region of the Northwest Frontier Province (NWFP). 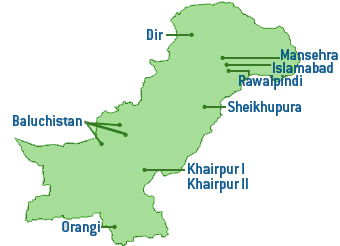 NWFP is the most conservative and under-developed province of Pakistan. The difficult mountainous terrain, lack of proper roads and conservative tribal traditions pose great challenges to female education. Living conditions of the local women are dire due to illiteracy and poor health. In Lower Dir, the female literacy rate is between 10% and 20% and in Upper Dir between 8% and 10%. In partnership with KK, DIL established the first-ever secondary schools for girls in Upper Dir in 2007. Baluchistan In 2003, DIL partnered with the Society for Community Support for Primary Education in Baluchistan (SCSPEB) to establish 10 middle schools for girls in the rural districts of Pashin, Mastung and Ziarat. Baluchistan is an area of unforgiving terrain, scattered population, seasonal migration, grinding poverty and political instability. Female literacy rates in the area stand at 20% and are amongst the lowest in the world. In the rural areas where DILs schools exist, the literacy rate is only 10%. Despite these challenges our students in Baluchistan are performing well in government exams and our program is now being replicated by other agencies working in the province. Islamabad After a decade of working with partner NGOs, in April 2006, DIL launched its own community schools in rural Islamabad— the Islamabad Capital Territory (ICT) project. DIL program staff now manages all education-related matters and the National Rural Support Program (NRSP) handles all community-related issues. The goal is to develop an educational model that can be replicated across Pakistan. Khairpur 1 DIL began working with the Naz Old Boys Welfare Association (NOWA) in 2001, making this one of DIL’s longest-running projects. The DIL-NOWA schools have provided rich experience for other project partners to learn from. Khairpur, a land of meticulously lined date palms and vast cotton fields, is situated 450 km north of Karachi and shares a border with India to its east. In the rural areas, only 53% of children attend primary school and only 48% of children older than 10 are literate. The average literacy rate for males is 65% and only 25% for females. 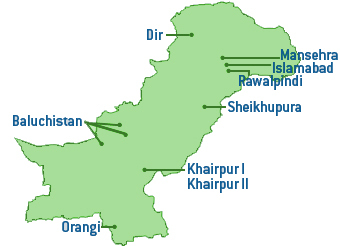 Khairpur 2 Since Khairpur is a large, impoverished district, DIL began a second partnership in the Khairpur area with the Indus Resource Center (IRC) in 2001 to provide quality primary and middle school education to girls. Mansehra DIL embarked on this project in the aftermath of the devastating 2005 earthquake that killed over 75,000 people and displaced almost 1 million school-aged children. In 2007, DIL, in partnership with AGAHI, completed construction and opened two new primary schools in Mansehra. Nestled high in the mountains, the District of Mansehra is renowned for its landscape and scenic beauty. The district is located at the eastern border of the Northwest Frontier Province (NWFP) — two hours drive from Peshawar and three hours from Islamabad. The average literacy rate for females is half that of males in rural Mansehra, 31% and 61%, respectively. Orangi DIL started working in this densely populated district of Karachi in 2001. Orangi has become the largest slum in South Asia. In this area, poverty is rampant, roads are practically non-existent and the sewage spills out over garbage-littered streets. The district’s various ethnic groups live in separate enclaves and the schools often reflect this division. Many students have to work after school to help support their families. Due to DIL’s direct management, the Orangi Schools have quickly become models for other projects. Rawalpindi DIL began working with the Adult Basic Education Society (ABES) in Rawalpindi in 2002 to set up child-friendly schools. The project centers on the rural communities where access to local government schools is limited. Although the city of Rawalpindi has eleven universities, the district’s literacy rate is only 70.5%. Over the years, DIL and ABES have worked hard to improve the quality of education in its schools. The staff is encouraged by the higher pass rates, improved classroom management and higher quality academics now found at the DIL-ABES schools. Sheikhupura In 2002, DIL began a partnership with the Cooperation for Advancement Rehabilitation and Education (CARE) to adopt five government schools in the Sheikhupura and Gujranwala Districts. This number eventually increased to six schools. DIL-CARE schools are situated in densely populated, poverty-stricken areas, inhabited mostly by poor tillers. Children often have to work to contribute to their family income leading to high dropout rates and even lower enrollment rates. Through the years DIL and CARE have made significant improvements to teaching quality, student enrollment and student dropout rates.